Avi Biswas, left, and Frances Ward, right, were recently reunited during Biswas’ visit to central Ohio. Frances Ward has never met a stranger. Talk to anyone who has ever met her and they’ll say the same thing. Meet and spend time with her and you’ll see it firsthand. At 84 years old, Ward’s charisma is infectious, and the exuberance with which she approaches conversation is a delight. Although she is retired now, those qualities had been on full display for Ohio Wesleyan students for over 30 years around campus, particularly for those dining in Smith Hall. Ward’s role at Smith Hall was to swipe meal cards when students came in to eat. While her position was naturally full of opportunities for conversation, Ward was never shy about seeking it out. And though she saw hundreds of students come through the doors in any given semester — a student even wrote their English paper on her — there was one in particular whom Fran would have, perhaps, her biggest impact on in her time at OWU. Avi Biswas had come to the United States from India in 2010 in order to finish his schooling. While he considered several options around the country, he ultimately settled on OWU due to the scholarship package offered. By himself in a foreign country, Biswas was naturally lonely at times. But an encounter with Ward during a stop in Smith Hall one day would give him some semblance of something he had been missing even before he came to America — a grandmotherly figure in his life. True to Ward’s nature, from that original conversation began a friendship that would last throughout Biswas’ four years in school. Biswas began dining regularly in Smith Hall, and he recalls always sitting at the table closest to Ward’s position so they could talk throughout his meal. Both remember the consistent message Ward would have for Biswas: Don’t sweat the small stuff. While Biswas’ relationship with “Grandma Fran,” as she was affectionately referred to as, flourished through his four years, Ward said she tried to let every student know she was there for them if they ever needed someone. When Biswas graduated in 2014, he promised Ward he would stay in touch with her. Biswas moved away, eventually to Canada to teach English to students as a second language. But a change in phone numbers for Ward severed the only remaining connection the two had, and after many failed attempts to get in touch with her, Biswas resigned to the notion he would never speak to his honorary grandmother again. However, a chance discovery by Ward’s daughter, Tonya Bryant, of a letter written by a student saying goodbye to Ward after graduation, moved and prompted her to seek out the “Avi B.” who authored it. “I’m going to work hard on my dreams, and I promise not to sweat the hard stuff, just like you said,” part of the letter stated. “I had to find this person … because the letter was just so beautiful,” she said. After searching through the OWU website, she had a full name to search. That search led her to Biswas’ Facebook page, which she messaged in hopes of having found the honorary grandson. Biswas’ described reading the message as a moment of joy and disbelief. 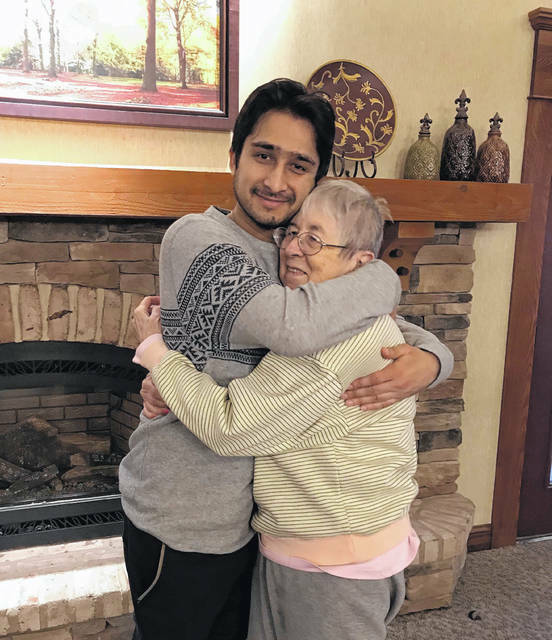 Biswas made his return to central Ohio earlier this month for a speaking engagement at OWU, and Bryant made sure that included a reunion with her mother. Of course, their time together was far too brief. Biswas is heading back to India where he will sift through job offers in various countries before deciding where he will teach next. But while short, the two didn’t skip a beat, picking up a conversation like they were back in Smith Hall. And when it was time to leave, the two exchanged phone numbers again to ensure it wouldn’t be the last time they spoke. For Biswas, although he may never find himself in Delaware again, he will always be grateful for what his time here meant for his future. In particular, he will always carry the fondest memories of a woman who gave him nothing more than her most endearing qualities — conversation, guidance and love. “It was really great coming back to this place where I partially grew up and became the person that I am today. OWU is a foundational part of my life, but Fran was certainly a big part of that,” Biswas said.